Former Canadian astronaut Marc Garneau at the controls of the Canadian robotic arm during his last mission in space, STS-97, in 2000. Canada's first astronaut is now aiming for a loftier goal: becoming the first head of state that has flown in space. Marc Garneau officially launched his bid Wednesday (Nov. 28) lead Canada's national opposition party. His goal, he said, is to put the country's Liberal Party back in power after the next election. "The Liberal party is here to stay, but that doesn't mean we can stay the same. We must, as a party, embrace change," Garneau told supporters in Montreal, Quebec, during a televised speech. The Liberals have been without a permanent leader since the end of the last Canadian election in 2011, when the Conservative Party easily won a majority and the Liberals lost many districts to other parties. Trudeau is the son of former Prime Minister Pierre Trudeau — who was known as much for his charisma as his policies – and has been in the public eye since childhood. Former Canadian astronaut Marc Garneau in training prior to his last mission in space, STS-97, in 2000. Garneau, who began his career in Canada's Navy, flew three times in space. His first mission in 1984 was as a payload specialist on STS-41G. 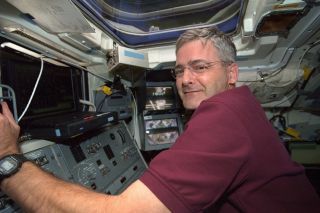 Garneau was called to Houston for mission specialist training in 1992, then flew on STS-77 in 1996 and STS-97 in 2000. While not naming his aims for Canadian space policy in the coming years, the former Canadian Space Agency president did include some space puns in the first day of his campaign, dubbed "Let's Take Canada To New Heights." "Believe me, this isn't rocket science," Garneau joked. "I know something about rocket science, and this isn't rocket science." Switching to speaking French, he added, "It is, nevertheless, a great challenge." In the United States, several astronauts have run for Congress, with mixed success. Most famously, John Glenn – the first American to orbit Earth – represented Ohio in the U.S. Senate between 1974 and 1999. Glenn returned to space during STS-95 in 1998, becoming the oldest astronaut to fly at age 77. In November, former NASA shuttle astronaut Jose Hernandez, a Democrat, lost his 2012 bid to represent California when voters in the state's 10th District chose a farmer instead. In the 1980s, Apollo astronauts Jack Schmitt and Jack Swigert were both elected as Republican representatives. Swigert died in 1982 before he could assume office, while Schmitt represented New Mexico for a single term.